This ornament can be personalized directly on the back (not on a plate). 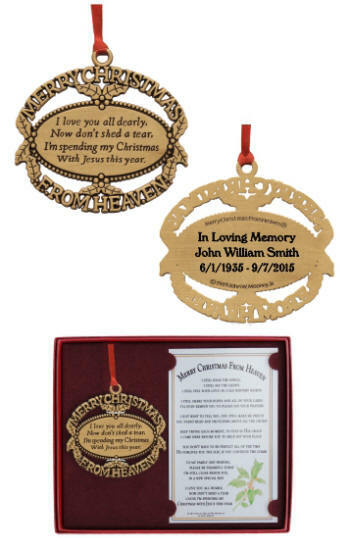 We personalize this Christmas From Heaven ornament with up to three lines of text, which is ample room for a message, a name and the dates of your loved one. Purchase one of these ornaments for each member of your family. Personalize them all the same, or make them special for each family member. A loving sister, A beloved wife, or any saying can be engraved, instead of In Loving Memory. Ornaments can be combined on the same order for the quantity discount, even if they are not engraved the same. This ornament is so special, it is packaged in a beautiful red gift box, with a red liner. The poem card that contains the Christmas From Heaven poem written by John Mooney is also included. The gold Christmas from Heaven ornament is tied with a red satin ribbon. Engraving is done directly on the ornament if desired.